CHICAGO -- Subaru of America, which has benefited from U.S. consumers' shift to crossovers, is turning its attention back to the Legacy midsize sedan, bolstering the redesigned 2020 version with an optional turbocharged engine, additional safety equipment and a revamped interior. The seventh-generation Legacy, introduced Thursday at the Chicago Auto Show, will add to Subaru's increasingly fresh lineup. But it's Subaru's first redesigned sedan since the 2017 Impreza was launched in late 2016. While Subaru just capped a decade of U.S. sales records and is enjoying a streak of 86 straight months of year-over-year U.S. sales increases, Legacy demand has been fading. U.S. Legacy sales dropped 20 percent in 2018 to 40,109. For context, the new Ascent three-row crossover, which went on sale in June, nearly matched that with 36,211 sales last year. In January, U.S. sales of the Legacy plunged 27 percent from a year earlier to 2,403. The 2020 Legacy moves to the Subaru Global Platform, following the Forester, Ascent, Crosstrek and Impreza. Keeping in line with the brand's recent redesigns, the Legacy looks similar to the outgoing version but has updated, sportier styling. Up front, the Legacy now has a frameless grille with the lower grille intake "molded to evoke the image of an aircraft," Subaru said. The sedan has wider fenders to emphasize tire and wheel presence, Subaru said. The Legacy comes with 17- or 18-inch wheels, depending on the trim. The most significant changes, however, are found under the hood, in the cabin and with new safety equipment. The Legacy's standard engine is the updated 2.5-liter boxer that debuted in the redesigned 2019 Forester. It generates 182 hp and 176 pound-feet of torque, up from 175 hp and 174 pound-feet of torque, and is standard on the Legacy in base, Premium, Sport and Limited trims. The redesigned Legacy also marks the return of a turbocharged engine option under Subaru's XT nomenclature. A turbocharged engine has been unavailable in the Legacy since 2012, the automaker said. XT models, either in Limited or Touring trim, get a 2.4-liter turbocharged boxer engine, which debuted in the 2019 Ascent, that makes 260 hp and 277 pound-feet of torque. With the turbocharged engine, Subaru estimates the Legacy can hit 60 mph in 6.1 seconds. All Legacys will continue to have a continuously variable transmission and all-wheel drive. The 3.6R Limited trim and its 3.6-liter six-cylinder boxer engine will be dropped for the 2020 model year. Except for the base trim, all 2020 Legacys receive a new 11.6-inch touch-screen infotainment system, a major change for Subaru. The automaker said it's the "largest, most advanced infotainment screen ever in a Subaru" and notes it will have a physical knob for audio volume. 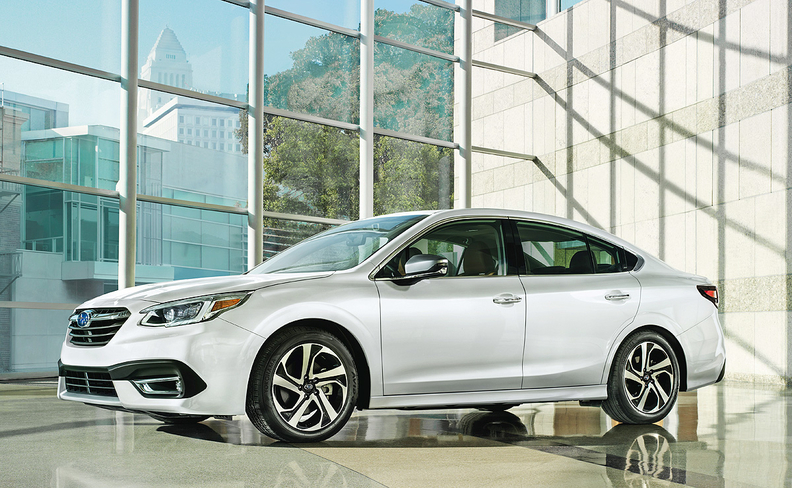 The Touring trim gets a standard navigation system with a split-screen display. It's optional on Premium, Sport and Limited. Base Legacy models come with a standard 7-inch touch-screen infotainment system. Wi-Fi connectivity is now an option, which is a first for the Legacy. The Legacy's instrument panel is also new for 2020 and features soft-touch wrapped surfaces. As with the outgoing version, Subaru's EyeSight safety suite is standard on all Legacys. The automaker added Lane Centering Function to the system which, when combined with adaptive cruise control, can provide steering assist when the vehicle veers outside the lane. DriverFocus, which debuted on the redesigned Forester's Touring trim, is optional on Legacys in Limited and standard on both XT models. The redesign adds another standard safety feature to the range-topping Touring XT trim called Front View Monitor. Subaru says it captures "images within the driver's blind spots in front of the vehicle and displays a 180-degree view" on the infotainment screen. The Legacy will continue to be built in Lafayette, Ind., alongside the Outback, Impreza and Ascent. The Legacy was the automaker's first nameplate built at the plant, which opened in 1989. The 2020 model is to arrive at Subaru retailers this fall. Pricing was not announced.